New Zealand’s first electronic toll road, the Northern Gateway toll road north of Auckland, was opened in January 2009. Since then, only two more toll routes have been established so as a visitor travelling around the country, toll fees aren’t exactly something you have to specifically budget for. That said, if you do use a toll road and forget to pay, it could be a costly mistake. Read on to find out why. 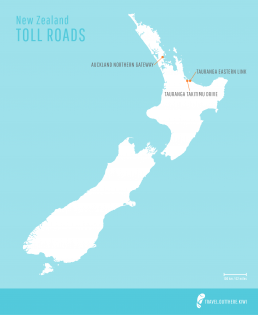 Where are New Zealand’s toll roads? As at April 2019, there are three toll roads in New Zealand, all of which are located in the North Island. They are all electronic meaning there are no barriers or toll booths as cameras are used to record vehicle registration plates (or number plates as we call them here). All our toll roads are quite well signposted and they all provide free alternative routes although, as you would expect, these routes are longer. That said, some alternative routes are a little more scenic and don’t actually add too much time and distance. 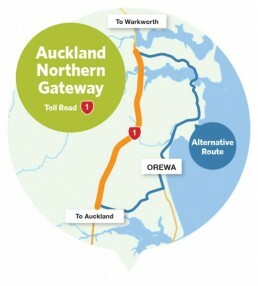 The Northern Gateway Toll is on State Highway 1 (SH 1) approximately 35 km / 22 miles north of Auckland. It’s a short section of motorway between the seaside town of Orewa and the village of Puhoi to the north and since this is the main highway heading north, you’ll probably consider using this route if you’re heading to the Northland region and main attractions like the Bay of Islands and Cape Reinga. Heading north on SH 1 there is a signposted offramp (Exit 394) which will take you through Orewa. This route follows the coast and then rejoins the motorway just before Puhoi. If however you find yourself driving through a tunnel, the Johnstone Hill Tunnels, then you missed the offramp. Heading in the opposite direction towards Auckland from Warkworth, take exit 388 towards Waiwera to bypass the toll. This alternative route will only add about 5 km / 3 miles and 10 minutes to your journey. An alternative way to travel north from Auckland is to avoid the SH 1 completely and go via Highway 16 (SH 16) on the West Coast. It’s a longer, narrower and in some sections twisty route, but very scenic in places. On days when the SH 1 is congested, (the start and end of long weekends for example), the SH16 is in fact the recommended route. Toll charges are one way. There is no extra charge for caravans and trailers. 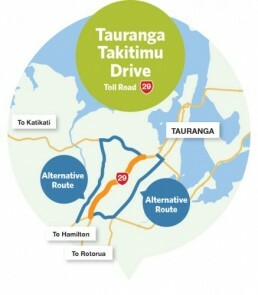 The Takitimu Drive toll road on Highway 29 is a short 5 km / 3 mile section of motorway that will allow you to bypass the city centre of Tauranga. This is particularly handy when approaching the city from the south and you want to head straight to the popular seaside suburb of Mount Maunganui. There are two alternative routes, via Cambridge and Moffat Roads to the west and via Cameron Road to the east. Bear in mind that Cameron Road will take you through the busy city centre which, depending on the time of day, could add 10 or more minutes to your journey. This section of toll road is on the main highway (SH 2) that runs east from Tauranga towards Whakatane. You’ll head this way if you’re going to visit White Island or the Eastland region. 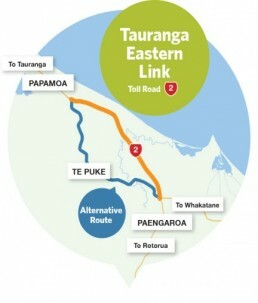 The 15 km / 9 mile tolled section of the SH 2 starts at the Domain Road interchange near Papamoa and continues until just before Paengaroa and the junction with State Highway 33 (SH 33) which heads towards Rotorua. The alternative route to the Tauranga Eastern Link toll road takes you inland through the small town of Te Puke. This route starts at the Domain Road interchange (look for the Free route East via Te Puke sign) and rejoins the SH 2 at the junction with State Highway 33. This alternative route only adds about 3 km / 2 miles and less than 10 minutes of travel time. We travel north from Auckland quite regularly and even though the toll road only saves us a few minutes, we tend to use it more often than not. So for us, a New Zealand Transport Agency account makes sense as our toll payments are handled automatically. But if you’re only visiting New Zealand for a short while, there’s no real benefit to opening an NZTA toll road account. Fortunately, there are other ways to pay toll fees. This is by far the best way to go if you don’t have an NZTA account. There is a Pay & Go option which will allow you to pre-purchase up to 10 toll trips per toll road at a time, and these are valid for two years. However, these are vehicle specific so you need to know your vehicle registration before you travel – not exactly practical if you haven’t picked up your hire car yet. The alternative is to pay toll fees online after you’ve driven and you can do this on the NZTA website using a debit or credit card. It’s quick and easy and all you need is your vehicle registration/plate number. You must however pay within 5 days of travel or face additional fees. More on that later. Of course if you’re worried that you might forget to pay and don’t want to incur a fine, Pay & Go might be a better option. And don’t worry, you can get a refund on any unused toll trips you’ve pre-purchased. Just make sure you keep your purchase receipt number. Most petrol/gas stations near the start and end of toll roads will accept over the counter toll road payment with cash or card but bear in mind that you’ll incur an additional transaction fee of $1.20. You will probably notice that on the motorway toll road signs there is a free telephone number (0800 40 20 20) which you can call for enquiries or to make payment. If at all possible, don’t pay your NZ toll fees over the phone as you will incur an additional service fee of $3.70. The quickest way to check if you have an outstanding toll payment is to visit the Buy or pay a toll page on the NZTA website. Once you’ve entered your vehicle registration details you will be able to see any outstanding tolls associated with that vehicle. To check how many unused Pay & Go tolls you have left, or to request a refund on unused tolls, visit the Refunds page on the NZTA website. As mentioned previously, you have 5 days in which to pay your toll road fees after which a Toll Payment Notice is sent to the registered owner of the vehicle along with an additional fee of $4.90. That said, even if it’s been longer than 5 days, it’s worth checking if you can still pay online because if the Toll Payment Notice hasn’t been sent yet, you might still be able to get away with paying just the standard toll fee. Count yourself lucky. Once you receive a Toll Payment Notice you can pay that online, ideally within 28 days or you risk receiving an Infringement Notice and an additional $40 fee. Skip that and you could have the Ministry of Justice paying you a visit. Finally, while we’re on the subject of additional fees, NZTA has something called a Dishonour fee which lets them “recover costs due to insufficient funds or credit available through your nominated payment method”. So make sure you have enough money on your card when you make a payment otherwise you could be hit for an extra $20.60. Seems a bit harsh but that’s the way it is. Visiting from overseas and driving a hire vehicle? Don’t assume that your hire company will automatically handle toll fees. Unless they are specifically covered by your hire agreement, you are responsible for paying them. Bear in mind that hire companies receive NZTA Toll Payment and Infringement notices, and they will happily pass these fees on to you, along with their own administration fee. This is one of the reasons why hire companies keep an imprint of your card details when you sign your hire agreement. One thing you do want to look out for are hire companies offering pre-pay toll passes as part of the hire agreement. Now that you know how much toll fees are likely to cost you, make sure that you’re not being overcharged for tolls, or paying for significantly more tolls than you’re likely to need.